This is a link to the bill drafts that we are currently watching: http://laws.leg.mt.gov/legprd/law_utilities.CallBillSearchResults?P_ENTY_ID_SEQ2=12544&P_PFLT_APPL_SEQ=1&P_SESS=20191. If you bookmark this link, you can check it at your convenience and it will always have the latest information available. This page will update once a week — generally on Monday. These updates will let you know what happened the previous week, what to expect the following week and details on bills being introduced. You always have the opportunity to offer input and feedback on how we react to each bill by contacting a board member or our lobbyist, Ronda Wiggers. The 2019 session is winding down and we are now down to just watching a small number of bills finish their way through the process. HB 341 funding for the Ground Water Investigation Program — the Senate Natural Resources Committee passed this bill unanimously this week. However, the bill still needs to get through the Senate Finance and Claims Committee and the Senate floor in order to be successful. It is likely being held until they determine if there is money left in the budget. The MWWDA joined our industry partners in support of this funding. The bill estimates that the Montana Bureau of Mines will spend $175,000 each year for contracted drilling and construction of test wells, stream flow monitoring sites, and well pumping services for aquifer testing. MWWDA has traditionally supported this funding as it helps to generate accurate information that the industry can access through the bureau’s website. HB 286 revising water right laws related to state water claims — the House concurred on the Senate amendment so, after a procedural third reading vote on Monday, this will be headed to the governor’s desk. As DNRC continues to oppose this bill, we may meet opposition in the governor’s office. This bill deals with the situation where a property owner has the point of diversion on their land and uses the water on state land. The state had attempted to claim a portion of this water right and this bill would make sure they do not. Using a 2.75 percent surcharge on state fund policies in order to help fund Medicaid expansion has been removed from the bill. Although the Medicaid expansion bill is currently tabled, it is expected to be passed this week. However, worker’s comp will remain out of the final version. Thank you for your calls. They worked! HB 341 funding for the Ground Water Investigation Program — the Senate Natural Resources Committee heard this bill on Wednesday. The MWWDA joined our industry partners in support of this funding. The committee has not yet acted on the bill. The bill estimates that the Montana Bureau of Mines will spend $175,000 each year for contracted drilling and construction of test wells, stream flow monitoring sites, and well pumping services for aquifer testing. MWWDA has traditionally supported this funding as it helps to generate accurate information that the industry can access through the bureau’s website. HB 286 revising water right laws related to state water claims — this passed the Senate floor on second reading with a vote of 38-10. After the third reading vote on Monday, it will return to the House for a do concur vote on minor amendments. We continue to support this bill. If you will recall, this bill deals with the situation where a property owner has the point of diversion on their land and uses the water on state land. The state had attempted to claim a portion of this right and this bill would make sure they do not. The Medicaid expansion bill that has passed the House proposes to implement a 2.75 percent surcharge on all state fund worker’s compensation policies in order to pay the state’s share of the necessary funding. YOUR CALLS ARE WORKING! We have been working with other industry associations to have this funding source removed from the bill. It is our understanding that an amendment will be offered in the Senate Finance and Claims Committee this week to remove the state fund as a funding source for Medicaid expansion. The sponsor has indicated that he will support this change. If you would like to call your local senator and encourage them NOT TO FUND MEDICAID EXPANSION WITH INCREASED WORKER’S COMPENSATION COSTS that would still be appreciated. I want to begin with a letter from the Department of Revenue concerning Special Mobiles. I have learned that the information that I had previously passed along was incorrect. Please read the update. It is relatively long so please click here — https://linkedin.us3.list-manage.com/track/click?u=42d0231ec5a42ded729ce334b&id=d8d759041d&e=bc3a027802. In summary, rather than requiring you to go get a refund for any overpayments in January or February, they are simply going to deduct them from your tax bill in May. The details are included in the link. An exempt well has been introduced this week. HB 708 revising volume for groundwater exemption — read the text at https://linkedin.us3.list-manage.com/track/click?u=42d0231ec5a42ded729ce334b&id=d0452b95c3&e=bc3a027802 — proposes to lower the current 35 gpm/10 acre feet to 35 gpm/5 acre feet. We believe that is problematic and will be opposing this bill in House Natural Resources committee on Monday. HB 341 funding for the Ground Water Investigation Program was heard in House Appropriations on Friday. The committee passed the bill back to the House floor for a third reading. The bill estimates that the Montana Bureau of Mines will spend $175,000 each year for contracted drilling and construction of test wells, stream flow monitoring sites and well pumping services for aquifer testing. MWWDA has traditionally supported this funding as it helps to generate accurate information that the industry can access through the bureau’s website. On Monday, the Senate Natural Resources Committee heard HB 286 revising water right laws related to state water claims — the committee has not yet taken any action. We continue to support this bill. If you will recall, this bill deals with the situation where a property owner has the point of diversion on their land and uses the water on state land. The state had attempted to claim a portion of this right and this bill would make sure they do not. HB 679 clarifying workweek for overtime eligible employees — read it at https://leg.mt.gov/bills/2019/billpdf/HB0679.pdf — was heard in House Business & Labor Committee on Friday. Although they did not act, the committee did not appear favorable. This bill specifically prohibits the ability to average in a two-week pay period and adds some requirements for fluctuating hours. HB 651 revising property tax on intangible personal property — read it at https://linkedin.us3.list-manage.com/track/click?u=42d0231ec5a42ded729ce334b&id=6ff625280f&e=bc3a027802 — will be heard in House Tax on Wednesday, March 27. A version of it comes nearly every session and it is never well received. This may apply more to our supplier members than to drillers. We begin with some good news. HB 341 Funding for the Ground Water Investigation Program has passed the House floor and is now headed to the Appropriations Committee. This bill funds the $250,000 annual budget with an ongoing appropriation, rather than coming back each session for funding. The bill estimates that the Montana Bureau of Mines will spend $175,000 each year for contracted drilling and construction of test wells, stream flow monitoring sites and well pumping services for aquifer testing. MWWDA has traditionally supported this funding as it helps to generate accurate information that the industry can access through the bureau’s website. On Monday, the Senate Natural Resources Committee will hear HB 286 revising water right laws related to state water claims — we will continue to support this bill. If you will recall, this bill deals with the situation where a property owner has the point of diversion on their land and uses the water on state land. The state had attempted to claim a portion of this right and this bill would make sure they do not. HB 679 clarifying workweek for overtime eligible employees — read it here. This looks like it may have an effect on your businesses. It specifically prohibits the ability to average in a two-week pay period and adds some requirements for fluctuating hours. HB 677 requiring corporations and LLCs to disclose beneficial owners — read it here. Although this is likely meant to work with the governor’s new proposal to ban foreign money from initiative campaigns, it may have an effect on some of our supplier members. You may want to read through it as it may apply more to some of our supplier members. As the information in the secretary of state’s office is public, it may be a violation of privacy to require this disclosure for no real purpose. HB 651 revising property tax on intangible personal property — read it here. I thought you may want to look this one over as well. A version of it comes nearly every session and it is never well received. Again, this may apply more to our supplier members than to drillers. MWWDA is closely watching the proposal to eliminate the State Fund, leaving all businesses in the private market, or a high-risk pool. This bill appeared to stall in the first half of the session, but is now moving through the drafting process. It is titled LC 525 Create Montana Workers Compensation Modernization Act. If the bill gets introduced, we will be asking you to reach out to your legislator and give you appropriate talking points to do so. We have avoided the usual controversial water bills this legislative session. The few water bills that caused concern — dealing with sale of water rights on exempt wells — were all tabled in House Natural Resources just prior to the legislative break. MWWDA supported HB 286 revising water right laws related to state water claims — and it passed the House. We will continue to support this bill as it moves through the Senate during the last half of session. If you will recall, this bill deals with the situation where a property owner has the point of diversion on their land and uses the water on state land. The state had attempted to claim a portion of this right and this bill would make sure they do not. We will continue to monitor the bills brought forward by the Water Policy Interim Committee. All of these are small, clean-up issues and the bills can be viewed by clicking on our link below and then clicking on the bill number of interest. One issue brought forward is what will happen to the Water Court when adjudication is finally finished. They are proposing a study bill to discuss this further. There was a good article in the Helena IR that you may find interesting. Click here to read it. MWWDA is closely watching the proposal to eliminate the State Fund, leaving all businesses in the private market, or a high-risk pool. This bill appeared to stall in the first half of the session, but is now moving through the drafting process. If the bill gets introduced, we will be asking you to reach out to your legislator and give you appropriate talking points to do so. We have spent most of our time focused on rules at DEQ, DNRC and DOR. Follows is the update on where they stand. DEQ has not yet finalized their rule. We are still hopeful that they will reduce the well setback from 1000’ to 500’ for DEQ regulated lagoons. BWWC held their hearing and were open to the proposal to leave the well setback for unregulated lagoons at the current 100’. The board will need to meet in order to finalize their rules. For details in how the new proposed rules would work, check out the update from last week or visit the website where all updates are posted. Just a reminder, if you paid your special mobiles in January, you need to go pay another visit to the Department of Revenue office and then your County Treasurer to get a refund on the amount you overpaid. The rates were adjusted as of February 1st and should more reasonably reflect the actual depreciated value of your equipment. SR 24, confirming Kevin Haggerty as one of the two industry representatives on the Board of Water Well Contractors, has passed the Senate. As many of you know, Kevin is a past president of the MWWDA and has served on the BWWC for many years. He was actually re-appointed a year ago but the Senate needed to officially confirm him. The MWWDA submitted a letter of support for Kevin. Confirmations do not go to the House for approval, so this is final. HB 286 Revise water laws related to State Claims will be heard in House Natural Resources was scheduled for last Friday but has been moved to Wednesday the 13th. This deals with the ownership of a well drilled on state lease land. To read the bill, click here. I believe this would encourage the lease holder to drill a well, as it clearly states that the well would be an improvement belonging to the lease holder, not the state. Tune in to the legislative website at 3:00, if you would like to hear the proceeding. We continue to visit with DEQ about the lagoon setbacks and are hopeful we can get the 1000 foot default reduced somewhat. While talking with them this week it was brought to my attention that this will only apply on lagoons that need DEQ permitting. It is my understanding that very few need this level of review. I will work with the BWWC to see if we can differentiate between these in their rules. Input is welcome!!! Conversation continues with DOR about the depreciation rates on our equipment and how to handle those that have already paid their Special Mobiles for 2019. If yours are not yet due, wait until March to pay these. The adjusted rates will apply at that time. If you get the opportunity to visit with your legislator when they are home for the week-end, please remind them that the State Fund is very important to small businesses with high risk jobs. We are doing our best to get that proposal stopped before it even gets introduced as an official bill. The MWWDA convention was a great success. Due to the Governor's State of the State address, we were unable to host our legislative friends for the trade show and dinner. A couple of them stopped by early in the evening to say "hi". Our focus at the legislature this week will be on two bills, following up with the rule making at both DOR and DEQ and a workers' compensation issue. SR 24 will be heard on Monday and will confirm Kevin Haggerty as one of the two industry representatives on the Board of Water Well Contractors. The MWWDA has submitted a letter of support for Kevin. HB 286 Revise water laws related to State Claims will be heard in House Natural Resources on Friday. This deals with the ownership of a well drilled on state lease land. To read the bill, click here. I believe this would encourage the lease holder to drill a well, as it clearly states that the well would be an improvement belonging to the lease holder, not the state. We continue to visit with DEQ about the lagoon setbacks and are hopeful we can get the 1000 foot default reduced somewhat. An issue with the Department of Revenue has come to our attention. Back in December they released a rule change on depreciation of personal property. For the most part, no one paid much attention. Then people began to get their Special Mobiles and we realized that the new numbers were wrong. The DOR has released a new chart and put them out for public comment. They will make the depreciation more in line with the actual market rather than the extremely high value that the first version of the rule created. I am working with them to discuss how to handle those that paid their Special Mobiles in January and February under the excessively high amount. And finally, there is a legislative proposal to privatize workers' compensation and do away with the State Fund. The bill would also create a high risk pool for those that could not get private insurance. After doing some checking, it appears this would be very expensive for businesses that are considered a risk for injury, like drillers. It would likely cause your rates to increase significantly if you could find insurance on the private market. if you cannot find affordable insurance, it would land you in the high risk pool that would also be pricey. If you get a chance to visit with your legislator, please let them know that our industry really needs the State Fund to remain viable. I begin by thanking all of you that offered comment and assistance with the DEQ proposed rules on lagoon setbacks. The hearing was held on Thursday and we offered testimony that the default setback — the 1000 foot requirement that you have to follow without a hydrological study — was generally too far and unworkable. Comments were also submitted by the Homebuilders, Realtors, Stockgrowers and Farm Bureau. After speaking with DEQ, I am hopeful that there will be some changes made before this rule is adopted. Here is the link to the current proposed rules. Water Policy Interim Committee bills were heard in both the House and Senate Natural Resources committee this week. All of them were to clarify areas in the adjudication and change process that appeared to be contradictory or unclear in the law. None of them directly affected ground water or the drilling of wells. SB 49 Amend method for measuring water for aquifer recharge or mitigation — this simply says that if you change your appropriation so that some of it is going toward mitigation and you may move the point of diversion where it is being measured. MWWDA monitored this bill. HB 45 Clarify criteria for water right permit relying on waiver of adverse effect — the DNRC determines the legal availability of water in another part of the process. This bill simply removes the language that indicates that they should make the determination a second time if there is a waiver of adverse effect. HB 44 Clarify criteria for water rights change application — this bill clarifies that the lack of legal availability of NEW water does not in itself create an adverse effect for a change in a water right. None of these bills have been acted on in committee at this point. HB 57 Clarify placement of definitions in water law — simply moves the definitions in the current law so that all that apply are in the same place in the code. We have checked, and it does not affect the way any other portions of water law are interpreted. Finally, I spoke again with Rep. Brad Hamlett concerning HB 180 Limiting transfers of water rights. He has determined that there is no way to amend this bill to do what he intended so he is simply going to ask for it to be tabled without a hearing. The introduced version in unacceptable to the industry. First, an update from our friends at the Board of Water Well Contractors. Last week we discussed the proposed rules for well placement near lagoons. Here is the link to the rules. The hearing for those rules will be in Helena this Thursday, January 17th at 2:00 in room 111 of the Metcalf Building. Everyone is welcome to offer comment. I had originally told you that the DNRC/BWWC hearing would be the following day. Due to some issues with the mailing of the official notice, their hearing will be held on February 22nd. I will attend the hearing and offer comment on behalf of the MWWDA. If anyone wants to join me, I will be glad to assist you in preparing to comment. The first week went as expected. Most of the time was spent going over rules and protocol and getting all the new legislators acquainted with how things work. The big surprise was the House GOP Caucus all supporting the rule changes without a public fight. The changes are pretty substantial and will slightly change the way we work to defeat bad legislation this session. On Friday, the Senate Natural Resources committee heard three of the Water Policy Interim Committee bills. With the exception of SB 32 that creates a statewide stream gauge oversight working group, the other three were clean up to clarify existing law and did not affect ground water. SB 49 Amend method for measuring water for aquifer recharge or mitigation — this simply says that if you change your appropriation so that some of it is going toward mitigation and you may move the point of diversion where it is being measured. MWWDA will monitor this bill. Although MWWDA will be monitoring both of these bills, we will likely not add further testimony as they have already been thru WPIC. In the draft requests are now a few bills dealing with exempt wells. I am visiting with the legislators about their intent and will keep our members posted. Finally, Rep. Brad Hamlett has introduced HB 180 Limiting transfers of water rights. He has personally told me that it does not say what he intended and that he will be making major changes. I am not confident in what those changes are, but will keep everyone updated. The current version is unacceptable. 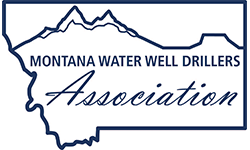 Happy New Year from the Montana Water Well Drillers' Association. The Montana Department of Environmental Quality is proposing new setback requirements for lagoons. The Mt Board of Water Well Contractors will follow with identical requirements once DEQ adopts their version. Every licensee will receive these in the mail. Here is the link to the rules. A little history and explanation is in order. While putting in a lagoon for livestock, it was discovered that the DEQ required a lagoon to be 500 feet from the nearest well. However, DNRC only required the well to be 100 feet from a lagoon. The result was that some had to remove a well, place the new lagoon and then replace the well in the same location in order to comply. They asked a legislator to bring a bill to correct this. MWWDA supported the bill as common sense change. It went a bit off-track at that point. DEQ insisted that rather than going with the 100 feet, we should allow science to dictate. MWWDA agreed that was reasonable, as each situation differs. We have been working on rules to implement this change since that time. The first proposal seemed a bit extreme and the Board of Water Well Contractors asked them to make changes. The proposed rule now requires a 1000 foot setback from a lagoon. I am not sure that is what the original requesters of change were hoping for! It does, however, include three different options based on bacteria, disinfection and groundwater gradients that could allow for a 200 foot and 100 foot setback. The rule goes on to outline what formula needs to be used to prove pathogen reductions or lack of hydraulic conductivity between the lagoon and the well. Although the original intent of the bill was to deal with a few isolated instances, it now changes the default setback for ALL lagoons in the state. If you are working in an area where you drill wells near these lagoons — livestock, sub-division, city, etc. — please look over these rules. Contact MWWDA — Ronda, Dave or a board member — with your comments. The hearing is January 17th and MWWDA will have the opportunity to offer comments and suggestions. For those of you not used to reading proposed rules, if the paragraph starts with a number (17.36.345) and a title, then it is current rule and they will cross out what they propose to delete and underline what they propose to add. The New Rule starts on page 2460 (don't panic, rules are numbered by page ALL year — it is actually on 17 pages long) There are about 10 pages that I really need you to read and offer your input. Above is the link to the bills we are watching. You will notice that a number of the bills from the Water Policy Interim Committee will be heard the first two weeks of session. MWWDA has attended all of these interim meetings and monitored these bills. Although there are some minor tweaks, there is nothing proposed that directly affects ground water or well drilling. MWWDA will continue to monitor these issues and offer input if necessary. Merry Christmas from the Montana Water Well Drillers' Association. As we draw near to the end of the year, it becomes time for your lobbyist to start watching the activity in Helena. There are a record number of bill draft requests for the 2019 session. However, the "water" list has not gotten too out of hand. You will likely recall that the MWWDA have joined other associations to sponsor exempt well legislation during the last two sessions. We worked with the Realtors and Homebuilders in 2015 to clarify the language allowing the use of exempt wells only to have our efforts vetoed by the Governor. In 2017 we worked with a broader coalition that included the agriculture groups, the irrigators and the senior water rights holders. Everyone compromised a lot on that bill in an effort to reverse the court's limits on the use of exempt wells. The Governor vetoed that effort as well. Thus, in 2019, your board determined that there was no point in bringing any legislation forward. We will instead be monitoring the legislation brought by others and weighing in as appropriate. We watch all issues pertaining to water law in Montana. I also keep an eye on general business issues and tax bills that may have an effect on your businesses. As those are spotted, they will be added to your watch list.